In its simplest terms, ‘mestizo’ is a Latin American term for a person of mixed race, particularly a person with both Spanish and American Indian parentage. It is also an appropriate name for the debut album by Mongrel State; a Dublin based country rock band with members hailing from Ireland, Argentina, Spain, and Italy who incorporate elements of the Nashville sound with the sounds, rhythms and on occasion, the languages of their home countries. Having earned a reputation as one of the Irish country music scene’s most formidable live acts in respect of their remarkable stage presence and fluidity as musicians, it’s no surprise that ‘Mestizo’ shines with the polish of a band with years of experience despite it being the band’s debut full-length release. The album is vibrant; showcasing a sharp, animated sound. 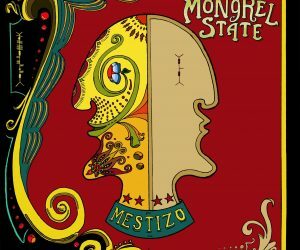 Produced by Gavin Glass, ‘Mestizo’ sees Mongrel State proudly wear their Americana hearts on their sleeves and let it all hang out making for a lively, entertaining listen for the most-part but not without moments of introspection such as the Morricone homage segue Quiero Volver in the album’s halfway point, and on closing track Rainy Day which plays out like a gunslinger riding off into the sunset. Album highlights such as Ten Steps Ahead, Desert Girl, and single Stray Dogs stay truer to Mongrel State’s live show and are driven, solid tunes glistening with old saloon pianos and punchy Tex-Mex brass. A well-produced and arranged album, Mongrel State solidify their prominence in the Eirecana scene with a colourful, lively debut release in ‘Mestizo’ which they will no doubt seek to build upon moving forward.